Hand injuries are common and account for 5-10% of emergency department (ED) visits nationwide. The complexity of the hand and the similarities in clinical presentation of different injuries make understanding of hand anatomy and function, good physical examination skills, and knowledge of indications for treatment indispensable for the emergency physician. Thorough knowledge of the anatomy and functions of the hand is required for proper diagnosis and treatment. Use of proper terminology prevents confusion that may compromise the care of patients with hand injuries. The following is a brief review of standard terminology and key anatomic structures. The hand and digits have palmar (volar) and dorsal surfaces and radial and ulnar borders. The digits are best described using their standard names rather than numbers. The proper names of the 5 digits beginning radially are thumb, index finger, long or middle finger, ring finger, and little finger. Motion and position: Standard terminology also applies to motions and positions of the hand and digits. Supination of the forearm positions the hand with the palmar surface superior. Pronation places the palmar surface inferior. Lateral motion of the hand, relative to the forearm, is described as radial deviation when the palm is supinated or ulnar deviation when the palm is pronated. Anterior and posterior motions of the hand, relative to the forearm, in its anatomic position are described as flexion and extension, respectively. Abduction of the digits refers to motion away from the middle finger and adduction to motions toward the middle finger. The fingers are in extension when held in the anatomic position. 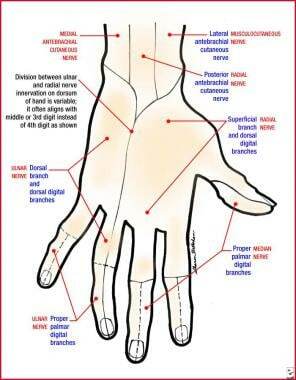 Movement of the digits dorsally is hyperextension, while movement toward the palm is flexion. In addition to flexion and extension, the thumb may move in toward the other digits (opposition) or away from them (retroposition). 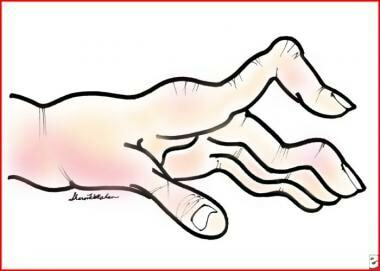 Surface anatomy: Three creases are present on the palmar surface of the digits. The distal and middle palmar creases correspond to the distal interphalangeal (DIP) and proximal interphalangeal (PIP) joints, respectively. The proximal digital palmar crease does not overlie a joint as the MCP is more proximal. 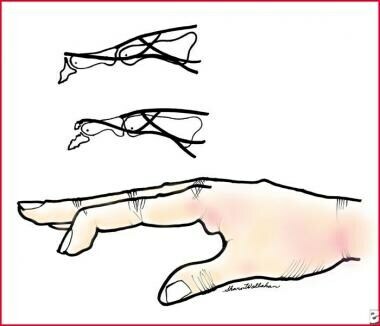 The long thenar crease partially encircles the thenar eminence and overlies the metacarpophalangeal (MCP) joint. Bony anatomy: The wrist is composed of 8 carpal bones arranged in 2 rows of 4. The flexor retinaculum together with the carpal bones forms the carpal tunnel. The median nerve passes through the carpal tunnel with the tendons of the flexor digitorum profundus and superficialis. The ulnar nerve enters the hand passing between the hook of the hamate bone and the pisiform bone in the Guyon canal. The metacarpal bones articulate with the wrist at the carpometacarpal (CMC) joints. The metacarpophalangeal (MCP) joints are formed by the articulation of the metacarpal bones with the proximal phalanges (see the image below). The heads of the metacarpals form the knuckles, which are seen dorsally with the closed fist. The thumb has only 1 interphalangeal (IP) joint, while the rest of the digits have proximal interphalangeal (PIP) and distal interphalangeal (DIP) joints. Each of the MCP, PIP, and DIP joints has collateral ligaments, which provide lateral stability, and a volar plate, which prevents hyperextension. The volar plate is damaged frequently in subluxation and dislocation injuries. Blood supply: The blood supply to the hand is derived from the ulnar and radial arteries, which form the superficial and deep palmar arterial arches by anastomosis. In the absence of vascular disease, either artery alone is sufficient to perfuse the entire hand in most of the population. Extrinsic and intrinsic muscles: The muscles of the hand are designated intrinsic or extrinsic. Extrinsic muscle bellies are in the forearm and their tendons insert into the hand, while intrinsic muscles both arise in and insert in the hand. The muscles of the hand and digits also are named according to their function as either flexors or extensors. 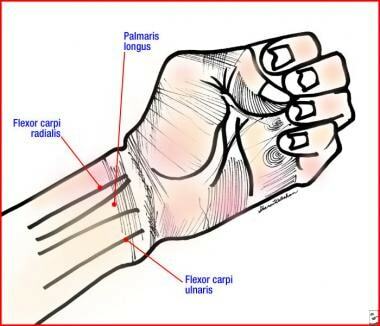 The tendons of flexor carpi radialis (FCR), palmaris longus, and flexor carpi ulnaris (FCU) are visible in the forearm (see the image below). The palmaris longus is absent in about 14% of the population. The median nerve lies between the palmaris longus and the flexor carpi radialis (to the ulnar side of the FCR). The flexor carpi ulnaris is a good landmark to locate the ulnar nerve and artery, which lie to the radial side of the FCU. Volar tendons at the wrist. These can be used as landmarks for injections. Flexion of the fingers is controlled by the flexor digitorum profundus and superficialis muscles. Both of the finger flexors lie on the ulnar side of the wrist with the median and ulnar nerves and the ulnar artery. The flexor carpi ulnaris and radialis flex the wrist when acting together and cause deviation to their respective active sides when contracting separately. Intrinsic muscles of the hand: Branches of the median and ulnar nerves innervate all the intrinsic muscles of the hand. They can be divided into 3 groups as follows: thenar (thumb), hypothenar (little finger), and lumbricals. The thenar eminence is formed by the extensor pollicis brevis and the 3 short thenar muscles: the abductor pollicis brevis, flexor pollicis brevis, and opponens pollicis. These muscles have short tendons that insert onto the proximal phalanx of the thumb. 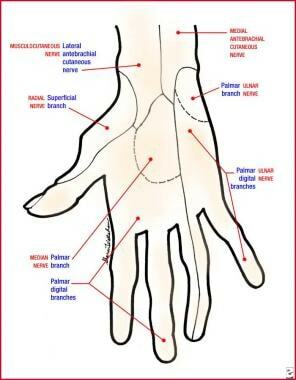 They are innervated by the recurrent branch of the median nerve. The superficial location of this branch renders it vulnerable to seemingly trivial trauma to the thenar eminence. The adductor pollicis adducts the thumb and by doing so, provides grip. 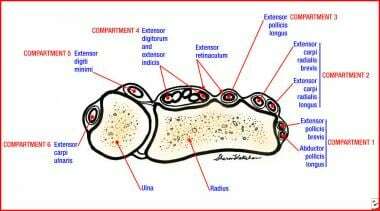 It is innervated by the ulnar nerve. The lumbricals flex the digits at the MCP joints and extend the IP joints. They place the fingers in the writing position. Seven interosseous muscles are located between the metacarpal bones; 3 are palmar and 4 are dorsal. The palmar interossei adduct, while the dorsal interossei abduct. 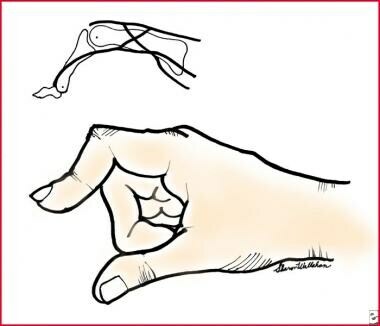 Forearm extensors: Eleven muscles extend the wrist, hand, and digits (see the image below). The forearm extensors pass into the hand in 6 compartments. All forearm extensors arise from the lateral epicondyle of the humerus. They are innervated by the radial nerve. Innervation: The median, ulnar, and radial nerves supply all of the sensory and motor innervation to the hand. The superficial volar and dorsal distributions of the sensory nerves are shown in the images below. The median nerve enters the hand via the carpal tunnel and often is involved in carpal tunnel syndrome. The median nerve sends motor fibers to the 3 short thenar muscles and the first and second lumbricals. The ulnar nerve sends motor fibers to the hypothenar muscles, the ulnar 2 lumbricals, the adductor pollicis, and all of the interosseous muscles. The radial nerve sends no motor branches to the intrinsic muscles of the hand. Neurapraxial injury occurs when a nerve is bruised or stunned but remains essentially intact. Axonotmesis describes a partial injury in which the axonal core of a nerve is damaged but the myelin sheath remains intact. These injuries usually regenerate at a rate of 1-3 mm per day. Neurotmesis is complete disruption of both axons and myelin sheath. It requires re-approximation of the nerve endings for healing to occur. DIP: The DIP joint is stabilized not only by collateral ligaments but by adjacent flexor and extensor tendons, making dislocations of this joint uncommon. If dislocation does occur, it usually is directed dorsally and often is associated with an open wound. DIP joint dislocations are detected easily by physical examination. PIP: The ligaments of the PIP joints are the most commonly injured in the hand. Dorsal dislocations are the most common and usually are the result of a blow to the extended digit, causing a combination of axial loading and dorsal deviation. Volar dislocations are uncommon because the joint does not resist motion in this direction. Lateral dislocation is the result of a tangential load applied to the extended digit that ruptures a collateral ligament and disrupts the volar plate. Ulnar deviation, with rupture of the radial collateral ligament, is more common than radial deviation. MCP: Dislocation of the MCP joint is uncommon, but when it occurs deviation is usually dorsal. The common mechanism of injury is the application of a dorsally directed force that is sufficient to rupture the volar plate. Dorsal dislocations in 60-90° of hyperextension and without intervening soft tissue are simple dislocations. Complex dislocations have the volar plate entrapped between the metacarpal and the proximal phalanx. Complex dislocations are less striking in their clinical presentation but are more serious injuries. Thumb: The IP joint of the thumb is very stable and seldom injured. Dislocations usually are dorsal and often open. The MCP joint of the thumb is one of the most frequently injured joints. Injury most commonly is caused by hyperextension force sufficient to rupture the volar plate and cause dorsal dislocation. As in MCP joints of the other digits, dorsal dislocation of the MCP joint may be a simple subluxation or complex dislocation. The complex dislocation is complicated by entrapment of the proximal phalanx. 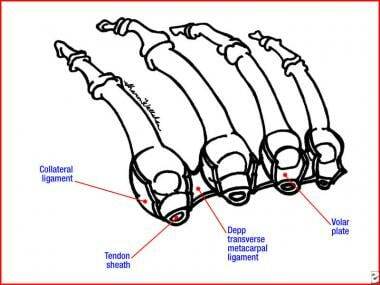 Joints of the digits are stabilized by the combination of collateral ligaments and the volar plate. Stretching or partial tearing of the ligaments results in a sprain. The volar plate may be injured alone or in combination with the collateral ligaments. The common mechanism for an isolated volar plate injury is hyperextension during an axial load. Pain location is a good indicator of the site of injury. For example, lateral pain suggests collateral ligament injury, whereas pain on the palmar surface of the joint suggests volar plate injury. Loss of stability more commonly is associated with joint dislocation. Sprains of the PIP and MCP joints produce pain and swelling but may lead to little or no instability. They are classified as first, second, or third degree. If the joint does not open at all but has pain with stressing of a ligament, the injury is first degree. A joint that is opened slightly in the ulnar or radial direction is defined as having a second-degree injury. This finding suggests a unilateral collateral ligament tear. A joint that is opened by at least 3-5 mm must have damage to at least 2 of the 3 structures stabilizing the joint (ie, volar plate, 2 collateral ligaments). This is referred to as a third-degree sprain or an unstable joint. Serious ligamentous injuries occur frequently and often are misdiagnosed because a mild sprain may have a similar presentation. Sequelae from missed ligamentous injuries range from chronically painful to chronically unstable or deformed joints. Sprains of the MCP joint are rare because of the anatomy of the joint, the laxity of the collateral ligaments, and the protection afforded the joints by surrounding structures. Hyperextension of the extended digit is the most common mechanism causing sprains. Diagnosis is indicated by a stable but painful edematous joint. The ability to hold objects between the thumb and 4 fingers is an essential function of the hand and depends upon an intact ulnar collateral ligament (UCL). Injury to the UCL is known as the gamekeeper's thumb or skier's thumb. This is because Scottish gamekeepers frequently damaged their UCLs killing game. The head of a small animal was placed between the thumb and index finger and a hyperextension/longitudinal traction force applied to the animal's cervical spinal cord by abruptly yanking the lower extremities. In a certain percentage of these procedures, the UCL of the gamekeeper was disrupted. In modern times, skiing is the activity that most often causes UCL injury. However, a history of a missed punch, a fall onto the thumb, or the forceful removal of an object from the flexed hand also should be considered suggestive of UCL injury. The common mechanism of injury is the forceful abduction of the thumb. Any patient with pain in the distribution of the UCL or inability to forcefully oppose the thumb has an injury of the UCL until proven otherwise. Rupture of the radial collateral ligament of the thumb is much less common than UCL rupture. The mechanism of injury is forceful adduction of the thumb in any position. Soft tissue injuries of the hand rarely are life threatening. However, the high incidence of disability from chronically painful or unstable joints is reflected by the fact that hand derangements account for 9% of all worker compensation claims. Hegge T, Neumeister MW. Mutilated hand injuries. Clin Plast Surg. 2011 Oct. 38(4):543-50. [Medline]. Lalonde DH, Kozin S. Tendon disorders of the hand. Plast Reconstr Surg. 2011 Jul. 128(1):1e-14e. [Medline]. Carty MJ, Blazar PE. Complex flexor and extensor tendon injuries. Hand Clin. 2013 May. 29(2):283-93. [Medline]. Woo A, Bakri K, Moran SL. Management of ulnar nerve injuries. J Hand Surg Am. 2015 Jan. 40 (1):173-81. [Medline]. Drake DB, Tilt AC, Degeorge BR. Acellular Flexor Tendon Allografts: A New Horizon for Tendon Reconstruction. J Hand Surg Am. 2013 May 24. [Medline]. Farnebo S, Chang J. Practical management of tendon disorders in the hand. Plast Reconstr Surg. 2013 Nov. 132 (5):841e-853e. [Medline]. Scalcione LR, Pathria MN, Chung CB. The athlete's hand: ligament and tendon injury. Semin Musculoskelet Radiol. 2012 Sep. 16 (4):338-49. [Medline]. Makhlouf VM, Deek NA. Surgical treatment of chronic mallet finger. Ann Plast Surg. 2011 Jun. 66(6):670-2. [Medline]. Dias JJ, Garcia-Elias M. Hand injury costs. Injury. 2006 Nov. 37(11):1071-7. [Medline]. Martinoli C, Perez MM, Bignotti B, Airaldi S, Molfetta L, Klauser A, et al. Imaging finger joint instability with ultrasound. Semin Musculoskelet Radiol. 2013 Nov. 17 (5):466-76. [Medline]. Melville DM, Jacobson JA, Fessell DP. Ultrasound of the thumb ulnar collateral ligament: technique and pathology. AJR Am J Roentgenol. 2014 Feb. 202 (2):W168. [Medline]. Allen GM, Drakonaki EE, Tan ML, et al. High-resolution ultrasound in the diagnosis of upper limb disorders: a tertiary referral centre experience. Ann Plast Surg. 2008 Sep. 61(3):259-64. [Medline]. Teefey SA, Middleton WD, Patel V, et al. The accuracy of high-resolution ultrasound for evaluating focal lesions of the hand and wrist. J Hand Surg [Am]. 2004 May. 29(3):393-9. [Medline]. Krieger Y, Bogdanov-Berezovsky A, Gurfinkel R, Silberstein E, Sagi A, Rosenberg L. Efficacy of enzymatic debridement of deeply burned hands. Burns. 2011 Nov 18. [Medline]. Patel J, Couli R, Harris PA, et al. Hand lacerations. An audit of clinical examination. J Hand Surg [Br]. 1998 Aug. 23(4):482-4. [Medline]. Antosia RE, Lyn L. The hand. Emergency Medicine: Concepts and Clinical Practice. 4th ed. 1998. 625-68. Chick LR, Lister GD. Emergency management of thermal, electrical, and chemical burns. Occupational Hand and Upper Extremity Injuries and Diseases. 1991. Chuinard RG, Friermood TG, Lipscomb PR. The 'suicide' wrist: epidemiologic study of the injury. Orthopaedics. 1979. 2:499-502. Cooney WP 3rd, Dobyns JH, Linscheid RL. Complications of Colles' fractures. J Bone Joint Surg Am. 1980. 62(4):613-9. [Medline]. Cowen NJ, Loftus JM. Distraction augmentation manoplasty technique for lengthening digits of hands. Orthopedic Rev. 1978. 7:45-53. Damert HG, Altmann S, Schneider W. [The potential of high-resolution sonography in the follow-up of surgically treated flexor tendons]. Handchir Mikrochir Plast Chir. 2006 Apr. 38(2):109-12. [Medline]. Greenspan A. Orthopedic Radiology: A Practical Approach. 1992. 2. Hergan K, Mittler C, Oser W. Pitfalls in sonography of the Gamekeeper's thumb. Eur Radiol. 1997. 7(1):65-9. [Medline]. Idler RS, et al. The Hand: Examination and Diagnosis. American Society for Surgery of the Hand; 1990. 3. Koslowsky TC, Mader K, Gausepohl T, et al. Ultrasonographic stress test of the metacarpophalangeal joint of the thumb. Clin Orthop Relat Res. 2004 Oct. 115-9. [Medline]. Kuschner SH, Ebramzadeh E, Johnson D, et al. Tinel's sign and Phalen's test in carpal tunnel syndrome. Orthopedics. 1992 Nov. 15(11):1297-302. [Medline]. Lister G. Undefined. The Hand: Diagnosis and Indications. 1993. 3. Louis DS. Barton's and Smith's fractures. Hand Clin. 1988 Aug. 4(3):399-402. [Medline]. Mehara AK, Rastogi S, Bhan S, et al. Classification and treatment of volar Barton fractures. Injury. 1993. 24(1):55-9. [Medline]. Moore KL. Undefined. Clinically Oriented Anatomy. 1992. III:591-607. O'Brien ET. Fractures and dislocations of the wrist region. Fractures in Children. 1991. 3. Palmer AK, Werner FW. The triangular fibrocartilage complex of the wrist--anatomy and function. J Hand Surg [Am]. 1981 Mar. 6(2):153-62. [Medline]. Salisbury RE. Soft tissue injuries of the hand. Hand Clin. 1986 Feb. 2(1):25-32. [Medline]. Schnur DP, DeLone FX, McClellan RM, et al. Ultrasound: a powerful tool in the diagnosis of ulnar collateral ligament injuries of the thumb. Ann Plast Surg. 2002 Jul. 49(1):19-22; discussion 22-3. [Medline]. Simon RR, Slobodkin D. Injuries to the wrist and hand. Emergency Medicine: A Comprehensive Study Guide. 1996. Vol 4: 1217-35. Skandalakis JE, Colborn GL, Skandalakis PN, et al. The carpal tunnel syndrome: Part I. Am Surg. 1992 Jan. 58(1):72-6. [Medline]. The authors and editors of Medscape Reference gratefully acknowledge the contributions of previous author, Kahill Glenn, MD, to the development and writing of this article.